Over that past few weeks we have had an abundance of fruits and veggies... oh wait... that's nothing new. Except this time we had mangos that I made my first mango jam with. that would be the yellowy-orange jar in the front. And no, I did not add any color to it... That's all real! With the tomatoes I made salsa (dark jar), and with the Hawai'ian hot chili peppers I just this morning made some hot chili water. The water is sort of like a tabasco sauce, but WAY hot. It's going to be great on rice and noodle dishes. Bring all to a boil in a covered saucepan then reduce heat to low and simmer 20 minutes. Transfer to a food mill and press through. Repeat 2-3 times, making sure to scrape the pulp from the bottom of the mill. 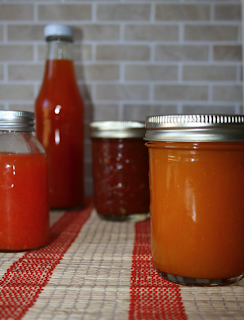 Store in clean jars and refrigerate. Should last a few months. Just came across your blog after it was sent to me by a good friend who's an event planner in honolulu. I have spent the last hour and a half reading it from 'cover to cover'. My partner and I live in new york and have fantasized for so long about doing what you guys have done. Congrats! And thank you for providing me a channel for living vicariously through you! Thanks for the comment and glad you enjoyed your adventure here at CFC. Nice to know we could brighten your day with a little Aloha. Hope to see you back soon. Those both sound really tasty! 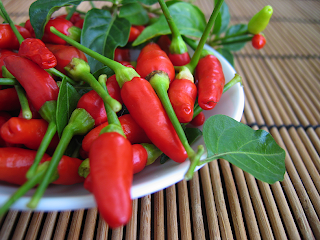 We grow habaneros in our yard, so you can probably guess that we like it hot. :) Never had a Hawaiian chili pepper though... wonder if we can get them here.